Angela Lansbury in "Dear World"
When discussing the musical theatre career of Angela Lansbury, sometimes Dear World gets lost in the shuffle amidst the more popularly received Mame, Gypsy and Sweeney Todd. The musical adaptation of Jean Giradoux’s play The Madwoman of Chaillot brought Lansbury her second of four Tonys for her work in musicals. The new musical reunited Lansbury with her Mame team, with Jerry Herman supplying the score and Jerome Lawrence and Robert E. Lee writing the book. However, those expecting another Mame were in for a surprise. The show is a delicate story about an eccentric woman in living in Paris, fighting greedy businessmen who wish to drill for oil in her beloved neighborhood in Paris. Hopes were high for a repeat success, with Lansbury signing another two year contract and producer Alexander Cohen sparing no expense in bringing the show to life. The play was a poetic satire that just didn’t translate well to the musical stage. There was trouble out of town as the show went through three directors (Lucia Victor, Peter Glenville and eventually Joe Layton) and negative reviews poured in. One of the major problems with both the musical and its source material was a decided lack of plot. Another reason was that the light play was being turned into a big Broadway musical. Trouble continued during New York previews, where there were 49 of them after several opening night postponements. Finally, after critics told the production they would just review it anyway, the musical limped open to mostly negative reviews. The show managed to eke out an official run of 132 performances at the Mark Hellinger Theatre. The general consensus was that the musical was of inferior quality, but that leading lady Lansbury as the Countess Aurelia was stunning. For the most part, the score is quite incredible. However, it was done in by some huge production numbers. The act one finale “Dear World” was an attempt to cash in Jerry Herman’s blockbuster success with a title song, which was at odds with the show’s story and style. “One Person” was another similarly big, brassy way to bring the show to a close. However, Lansbury stopped the show cold with her act one waltz “I Don’t Want to Know,” stunned with the devastating “And I Was Beautiful” late in the second act and took part in one of the most impressive musical scenes written by Mr. Herman, “The Tea Party” in which Aurelia and her two closest madwomen gather to take action but get lost in their memories and delusions. When the score is light and delicate, it is more in tune with the nature of the original play. For what its worth, a film version of The Madwoman of Chaillot was released that same year starring Lansbury’s good friend Katharine Hepburn. It too was dismissed by critics and audiences. 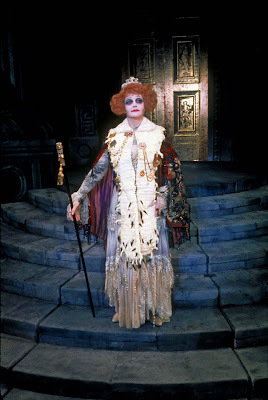 However, Lansbury’s Tony-winning performance is still well-regarded by those who managed to see it. The score is worth checking out on the original cast album, as there is much to enjoy with Lansbury and her ensemble (her support was Jane Connell, Carmen Mathews, Kurt Peterson and Milo O’Shea). Once you hear Lansbury’s “And I Was Beautiful,” you will never forget it. As for the failure, Lansbury assigned blame to herself saying that audiences were expecting another Mame. But given her reception in the part, it seems very clear that she was the least of the show’s troubles. The creators have continued to revise the score, with a chamber production that played at Goodspeed in 2000. There was also a late 90s workshop at Roundabout with Chita Rivera as Aurelia, and supported by Madeline Kahn. But neither of those have had any continued life. I do think that Encores! should eventually get around to presenting it in their season.